As the Summer Solstice approaches, we see nature’s abundance everywhere as the days are at their longest, filled with sunshine and life. Cultures since the dawn of time have worshipped the sun and its radiance and have created rituals to honour the light that it bestows. Sun Salutations, or Surya Namaskar, are one way that Yogis honour the physical and spiritual heart of our world and the creator of all life itself. The word Surya translates as sun and Namaskar means ‘to bow to’ or ‘to adore’. For many, Surya Namaskar is a prayer in motion. The history of Surya Namaskar is not entirely clear. While the Hatha Yoga Pradipika, the oldest known hatha yoga text, does not mention Sun Salutations, there is evidence of variations of the practice in the Ramayana, the famous Hindu epic poem (2nd century BCE). Some believe that is it a relatively modern sequence created by the great teacher Krishnamacharya in the 1930s. But for those of you who love a good story (like me!) there also some beautiful mythology surrounding Surya Namaskar and the monkey warrior god Hanuman. Often the myths and the corresponding feelings and images they evoke create a much deeper resonance with the practice. This story certainly did that for me. Hanuman was born with supernatural powers, which included a voracious appetite as a child. Being constantly hungry, he was always searching for food. One day when his mother was out, he looked up at the sun, Surya, and mistook it for a ripe, juicy mango. 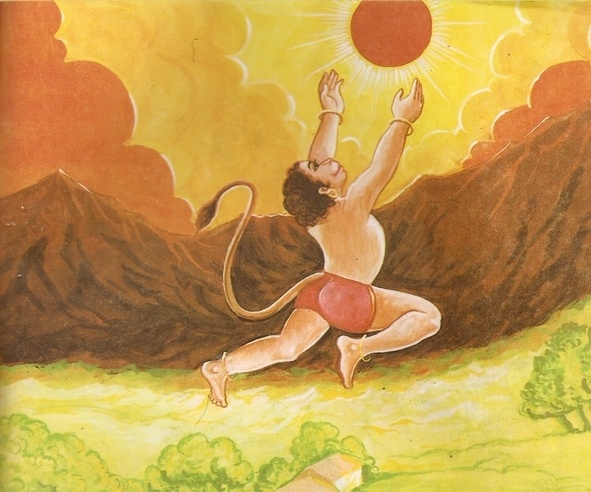 Taking an incredible leap into the sky, Hanuman grabbed the sun and started to eat it. But in that moment, the earth became covered in darkness – which caused all the other deities to become concerned. He was asked to release Surya, but he stubbornly refused. Only after having his jaw broken, was the sun released back into the sky. As Hanuman grew, his mother decided that he needed an education. His mother approached Surya asking if he would tutor her child. The sun refused, remembering the past transgression, but also saying that it was impossible for him to teach the boy as he was constantly on the move. Hanuman insisted that he would be able to keep up with Surya and so the sun agreed faithfully shared all his wisdom with Hanuman. In gratitude, Hanuman offered to pay Surya his ‘guru dakshina’ which is the customary offering to the teacher. However, Surya refused. So Hanuman decided to honour his guru through the practice of Surya Namaskar – imitating his movements across the sky each and every day. Today Surya Namaskar is practiced in many variations. Traditionally mantras accompany each of the 12 positions, with each mantra honouring the 12 zodiac signs in Hindu astrology and the 12 sound syllables containing the Shakti (energy) represented by the sun. Below is an image of the positions as well as the mantras. Perhaps this June 21st, the Summer Solstice, take some time to slowly move through each of the poses repeating the mantra and visualizing the sun shining its eternal light upon you. Even better, practice outside. A beautiful way to pay homage to the life force of the sun and to feel its Shakti energy within you. Enjoy! Note: I would love to credit the artist who created this beautiful Surya Namaskar illustration but could not find a name with the image. Salutations to you!